July 18 2018. 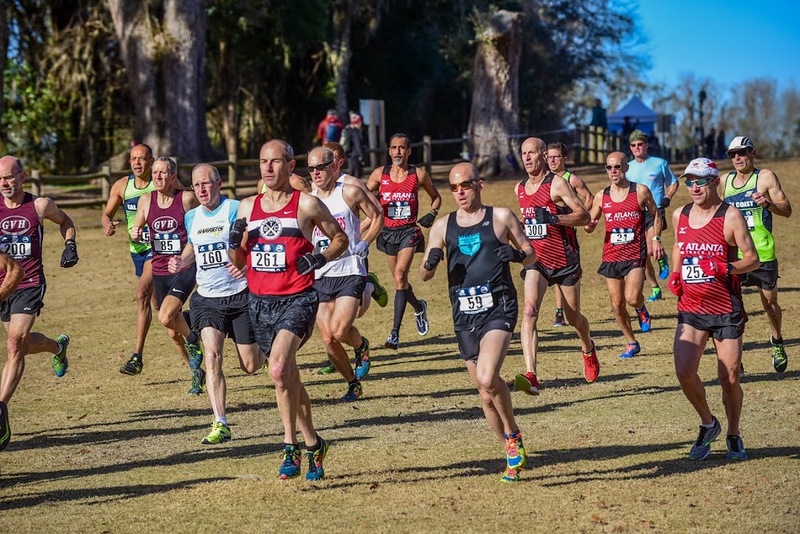 Each year the USATF Masters LDR Committee awards prizes to the winners of its Masters Grand Prix series, consisting of the National Championship Masters Road and Cross Country Races. There are prizes for both Individuals and Club Teams. There are 9 events in the Grand Prix this year and 5 are in the books-Club Cross Country Lexington KY, Cross Country Nationals Tallahassee FL, 8K Virginia Beach VA, 10K Dedham MA, and Half Marathon Ann Arbor MI. The remaining events are the 5K Atlanta GA, the 1 Mile Flint MI, the 5 km Masters Cross Country Buffalo NY, and the 15K Tulsa OK. Points from the best 5 Championships are summed to get the GP point total; individuals must score in at least 3 events to qualify for a prize. Points in each Championship range from a high of 100 down, in 5-point increments, to 5 points; a perfect score is 500 points. The same scoring rules apply to the Individual Grand Prix but the point assignment per race is slightly different. 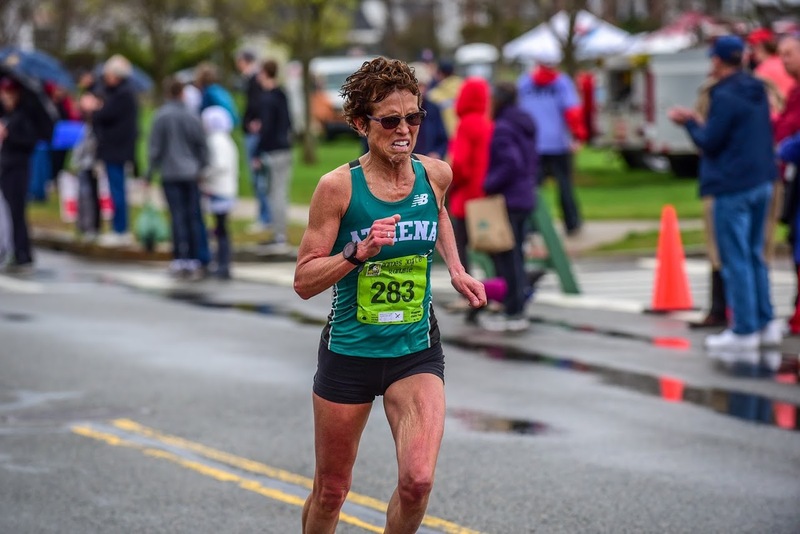 The 2017 Individual Grand Prix winners in the 5-year age divisions were: Women’s 40-44 Wakenda Tyler W45 Cassandra Henkel W50 Marisa Sutera Strange W55 Lorraine Jasper W60 Jill Miller-Robinett W65 Sabra Harvey W70 Dianne Anderson W75 Madeline Bost; Men 40-44 David Angell M45 John Gardiner M50 Kent Lemme M55 Nat Larson M60 Kyle Hubbart M65 Tom Bernhard M70 Paul Carlin M75 Charlie Patterson M80 Jim Askew. W40 A GVH athlete has won this category the last 3 years, Melissa Senall in 2015 and Wakenda Tyler the last 2 years. Senall has aged up and Tyler is off to a slow start. Their teammate, Heather Webster has the lead at 190 points from 2 events (designated after this by 190 ) where she took 1st and 3rd. Four athletes are tied for 2nd with 100 points from winning one of the 5 events thus far, but none have entered another event yet. Melissa Gacek has entered the 15K but will she fit in a 3rd event? The trick for this age group has been to reach the 3-event minimum. The only other runners with 2 events in so far are Vanessa Lordi and Iwona Boruch, with 65 and 50 points respectively. Webster is favored to take this division. On the other hand, Lordi has already signed up for the 15K which gives her a third qualifying event. Another runner with 65 points from Club XC is Alice Kassens who is already entered in the 5K and 15K. That makes her a potential podium threat in this division. W45 Cassandra Henkiel won this division last year but has just 90 . Jennifer Bayliss is leading with 200 points from her wins at Cross Country Nationals and the 10K. Sonja Friend-Uhl who won in 2016 is in 2nd place with 190 . Her main focus is on the track so it is never certain how many events she will enter. She will at least get in the minimum of 3 as her entry in the 5K in Atlanta attests. Melissa Senall, currently in 3rd place with 175 , took the 2015 W40 Grand Prix win and is perhaps the favorite for this division. As an active member of GVH it is likely she will compete in a few more events this year. And she does not have to win Championships to win the Grand Prix in this division. If Senall continues to finish in the top 5 she could well amass enough points to win. 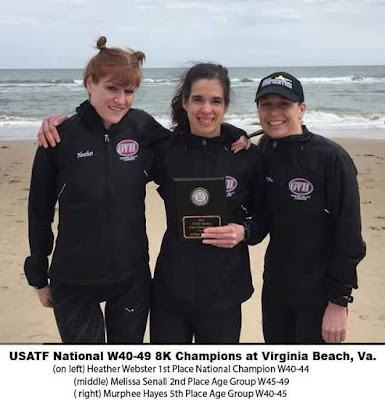 W50 Marisa Sutera Strange has won this event the last two years and would seem to be in the driver’s seat again, with 400 points from her wins in the 2 Cross Country events, the 8K and 10K. If she wins one more event she will have a perfect 500 points and be unbeatable. However, she will likely finish the year in the 55-59 division; her entry in the 5K puts her in that group. This would be her third consecutive year to win with a perfect score. No one else has two consecutive years yet. Michelle Simonaitis is giving her a run for the money though with 290 . She is enjoying a great year after taking a break from the circuit of National Championships. Once Strange moves up to 55-59, Simonaitis slides into 1st place in 50-54. Although not yet entered it seems likely she will enter the 15K in Tulsa. Carol Bischoff would be in 2nd with 235 . As a GVH stalward, Bschoff is likely to eb in 1 or 2 more races. Nancy Thomas is in 4th with 170  and has entered the 5K in Atlanta so will get the 3 races she needs. Laurie Wharton may also factor into the podium race. 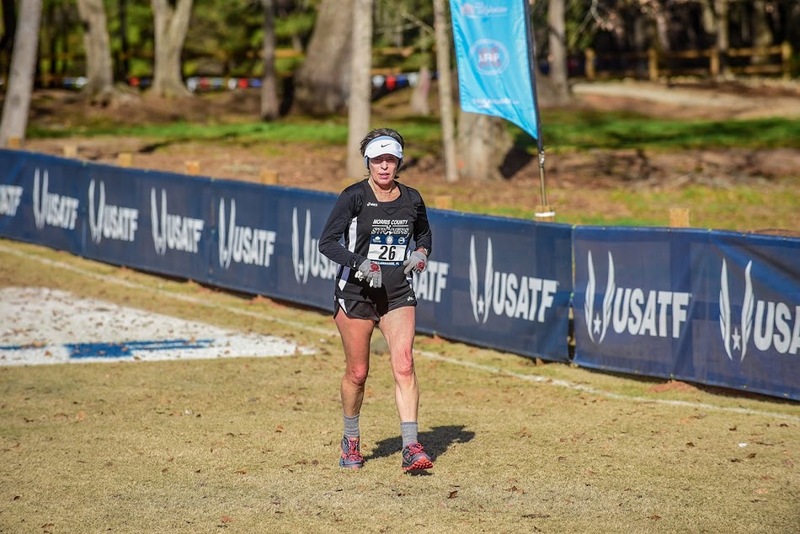 She has 60 points from the 10K, is entered in the 15K, and would be expected to compete in the 5K for her Atlanta Track Club. W55 Lorraine Jasper took this category last year after two consecutive wins by Colleen Magnussen. Mary Swan leads this year with 345 . Magnussen is in 2nd with 320 , followed by Karyl Sargent with 300. Swan’s teammate, Doreen McCoubrie, in 4th with 295  has the highest points per contest so could finish on the podium if she competes in 2 more events. She is entered at Tulsa in the 15K. Trish Butler is in 5th with 185  but her team is focused on the World TF Championships this year, so her participation has been limited. As noted above, the likely winner in this division has no points in it yet. But as soon as Marisa Sutera Strange completes a race, she will be moved into the 55-59 division along with the 400 points she amassed in the 50-54 division in the first part of the circuit. She is a strong favorite to take the title with 500 points. W60 Defending champion, Jill Miller-Robinett has only been able to compete in 2 events so far this year, totaling 195 points. She can score at a high level if she is entered, so she may yet move up the standings. But it is very crowded at the top with 20 points separating the four leaders. Joanna Harper has 335 , followed by Cynthia Williams 330 , Patricia Ford 320 , and Sharon Moore 315 . Like Miller-Robinett, Patrice Combs is back a bit, tied for 8th with Catherine Utzschneider with 200 . But unlike Miller-Robinett and Utzschneider, Combs is already entered in the 5K which would give her the 3 race minimum. But she would need to enter at least one more race to have a shot at the podium and might need 2 more. W65 Sabra Harvey, the defending champion, is focused on defending her World TF Championships in Malaga, so is in 4th with 200 . She could total 400 points if she would win both the 5km Masters XC in Buffalo and the 15K in Tulsa, the only two events left after Malaga. But 400 will probably not be enough points to win this division. The top two this year are Red Lizard teammates, Suzanne Ray at 385  and Jeanette Groesz at 375 . Both ran at Tulsa last year and are expected to do so again. If so, they should both finish with over 450 points. Cindy Ingalls is in 3rd at 235  and will likely enter 1 or 2 more contests this year for her GVH team. W70 Dianne Anderson is the defending champion here and she is currently tied for first. But like Suzanne Gibson and Jan Holmquist, she has 100 . Anderson is the only one of those three in recent years who has been getting enough events in to take the Championship, but that will depend, in part, on how active her team is this late summer and fall. W75 Madeline Bost has won this title for four years in a row. So far, each year she has been the only athlete to contest the 3 events necessary to win. She leads at this point with 200 . Kathleen Scotti and Mary Nagle each have 100 . Bost has sometimes contested the 5K in the past when it was in Syracuse but she may not choose to make the trip to Atlanta. It is likely she can get the 3rd event in the form of the 5 km XC Championship in Buffalo; she has typically contested that event, whether in New Jersey, Indiana or Florida. M40 David Angell is the defending champion and has a commanding lead with 480 . Garden State teammates, Sam Teigen and Aaron Cooper, are 2nd and 3rd with 355  and 200 . Neither can catch Angell unless they run the table, winning the last 4 events. So far, neither has beaten Angell in several tries this year. Greg Mitchell is in 4th at 180 . Mitchell, the Grand Prix winner in 2014 and 2015, has the talent; he came in ahead of Angell in the Half Marathon in early June, and just behind him at Club Cross Country. But Mitchell turns 45 in September. will not have enough points to catch Angell in 40-44 without running more races. As soon as he contests a Championship, Mitchell will be moved up to the 45-49 division along with the points he has accumulated in the 40-44 division. As soon as Angell finishes 2nd or 1st in a Championship, he will have iced the 40-44 win for a 2nd year. He is entered in the 5K at Atlanta. M45 John Gardiner won the M40 Grand Prix in 2016 and this division in 2017 but he is off to a slow start with only the 95 points from his 2nd place finish at Club Cross Country. In the meantime, Jonathan Frieder, who finished 2nd to Gardiner last year, is off to a great start, leading the field with 445 . Trailing him are Brent Fields, with 350  and Philippe Rolly with 290 . Rolly is a potential threat because he has beaten Frieder in the three contests he has entered. If he enters two of the remaining 4 contests, it is likely he will outpoint Frieder. Right now, it looks unlikely Gardiner will contest the additional 4 events he needs to pass Frieder, and/or Rolly but if he contests both the 5K in Atlanta and the 1 Mile in Flint, that would elevate his podium chances considerably. It seems likely he will run the 15K in Tulsa. As noted above, Mitchell is in this group at the end of the year if he runs in either of the last two events. If he enters three events and finishes ahead of Frieder in any that they both contest, Mitchell could move ahead of Frieder. The added wild card in M45 is Kevin Castille. Based on current form, he wins any Masters Championship he enters. But he only enters a few, preferring to balance his Championship efforts with prestigious non-Championship events like the Gate River Run and the AJC Peachtree 10K. 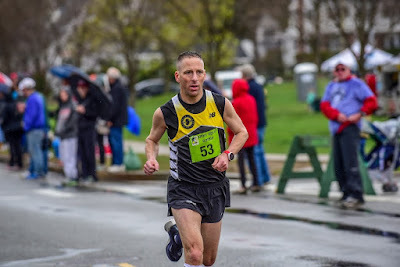 Castille is entered in the 5 km Masters Cross Country Championship already and in the past has often contested the 5K when it was in Syracuse. He ran the 15K last year. If he runs, it makes it more difficult for Gardiner, Mitchell, and Rolly to get the points to catch Frieder. This division will certainly be fun to watch! M50 Kent Lemme is the defending champ and he is currently in first with 390 . His teammate, Mark Hixson, is in 2nd with 330 , followed by GVH teammates, Dale Flanders at 290  and Mike Nier 255 . If Lemme runs the second part of the season as he did the first, he should finish well ahead of those three. Ordinarily Christian Cushing-Murray, who won the 45-49 division in 2015, would be a threat but he has been recovering from last year’s injury time lost and finished behind Lemme at both Cross Country events. The only two runners who have beaten Lemme this year are Carl Combs and Peter Hammer. Combs typically can only break free for 2 or 3 events a year and the only event Hammer typically contests is the Club Cross Country Championship. Lemme seems likely to repeat. M55 Nat Larson took this division by a landslide in 2017 and is way ahead this year with 400 . If he wins the division at his next race, that would give him a perfect 500 points for the 2nd year in a row, and an unassailable lead. If he succeeds, he would be the first male runner to earn 500 points in the Grand Prix in two consecutive years. Tom Bernhard in M65 can match him by also doing it this year. Gary Leaman is 2nd with 230  and Dennis Kinney at 200  and John Van Kerkhove 200  are tied for 3rd. 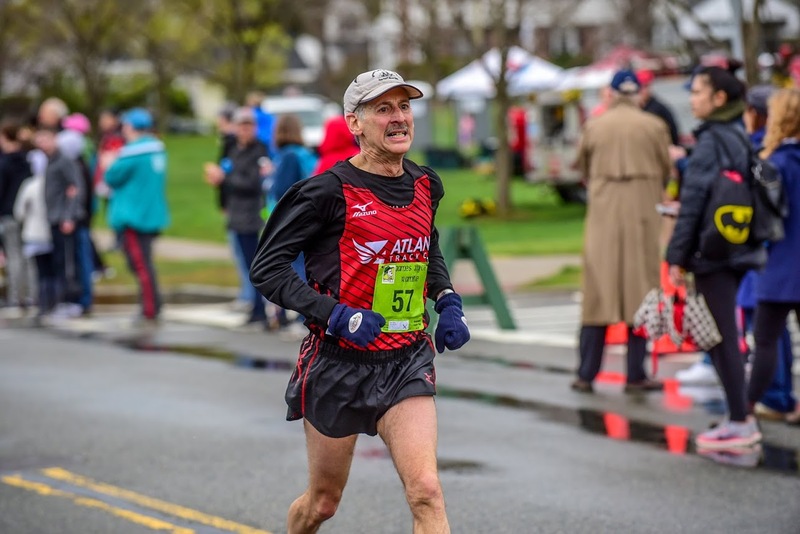 Alan Evans 95  and Eric Stuber 100  will both age up this summer and could factor into the podium battle if they decide to enter another championship or two. M60 Kyle Hubbart won this division last year but has been battling back from an injury and has not competed. Even if he would come back for the last 4 events, it is unlikely he can make the podium this year; the division is stronger than ever. Ken Youngers who won the 55-59 Grand prix is back on the top of his form and has 365  for 1st place. Reno Stirrat and Youngers’ teammate, Mike Anderson, are tied for 2nd with 325 . There are two bigger threats though, both from west of the Mississippi. Rick Becker is currently in 4th with 290 ; Becker beat Youngers at both Cross-Country events this season. In the past, Becker’s duties as Cross Country Coach have limited his participation in fall events but that will not be true this year as he is only coaching Track, not Cross Country. He has already entered the 5K in Atlanta and will likely contest the 15K. But he still might not win. The only runner in this division to beat Becker this year is Roger Sayre who is in 5th with 280 . Sayre is entered in the 15K; if he runs another event and stays on top of his form, Sayre is a slim favorite for the division title. Lots of fireworks yet to come in this division! M65 Tom Bernhard took this title last year with a perfect 500 points and despite being in 8th place right now, has laid the groundwork for a repeat performance. Bernhard prefers roads to cross country, skipping the two cross country events that kicked off the season. But he has won the two road events he entered. 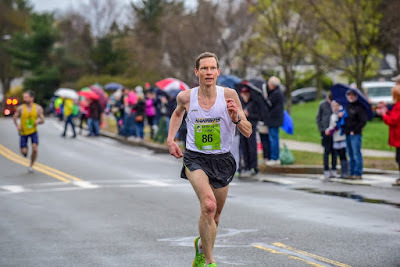 If he can enter and win the 5K, 1 Mile, and 15K, as he did last year, he will get his 500 points and his 2nd consecutive perfect score win, just like Nat Larson in M55. In the meantime, Kirk Larson, who finished 3rd last year, has the lead with 350 , just ahead of his Atlanta teammate, Jerry Learned, with 345 , and Eduardo Matsuo at 295 . Learned is not a threat in the division because he will age up to M70 when he races next. Two bigger threats to Larson, in addition to Bernhard, are Doug Bell in 4th with 280  and Chuck Smead, with 275 . Both are likely to run at least two more events and have recently been finishing ahead of Larson. M70 Paul Carlin, your author, won this division last year, but was rehabbing (again) a recalcitrant hamstring earlier in the year and am just regaining my form; I am in 6th with 260 . My string of 4 straight podium finishes in the Grand Prix will almost surely come to an end as there are at least three and probably more athletes likely to amass more points. Dave Glass is currently in first place with 470 , followed by Tony Gingello 335  and Gene French at 300 . But there are two other runners who have a good shot at coming in ahead of Glass. Gene Dykes is currently in 5th place with 295 . That would be 300  except he was in the 65-69 category for the 8K and lost to Tom Bernhard; he would have won the 70-74 division handily. If Dykes stays healthy and enters two more events, he will win them and vault to 495; if he wins a third he gets the perfect 500. On current form, no one in the division can beat him. Another runner Glass must worry about is Lloyd Hansen currently in 9th with 175 . 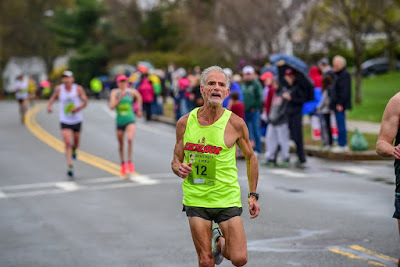 Hansen, the 2014 and 2015 winner of the 65-69 Grand Prix, is coming back from injury and finished a strong 2nd to Dykes in the Half Marathon and well ahead of Glass; he just aged up in May. Hansen is already entered in the 5K, 1 Mile, and 15K. If he can run in each of those and finish 2nd to Dykes or better, that would give him 460 points. He would need to enter the 5K Cross Country as well and pick up another 95 points which would replace the 80 he earned from 65-69 and vault him to 475, just ahead of Glass. That assumes that Dykes runs in every event that Hansen does and beats him; that may not happen. It also assumes Glass stays at 470; if Glass can eke out two second place finishes, he moves up to 480. Terry McCluskey, Hansen’s teammate, also ages up this summer and will bring his 150  with him. McCluskey finished close to Hansen in the Half Marathon and comfortably ahead of Glass. He is too far behind to catch Glass even if he would win every event remaining, which seems unlikely. But he may make it hard for Glass to improve his current score. I mentioned that Jerry Learned 345  will age up to this division after his next race. If the scenarios considered above come to pass, he will be battling with Gingello, French, Jim May 265 , Przemek Nowicki 230  and me for 5th, however, not for the podium. M75 Charlie Patterson won the division last year but will be hard pressed to repeat even though he is currently in 2nd with 270 . That is because Robert Hendrick aged up this year and sits in first with 395 . He has won all but one of the events this season. If he wins one more he has 495 points, and no one can catch him. The only worry for Hendricks is Doug Goodhue who beat Hendrick in the 10K event. Goodhue is coming out of injury rehab in 5th place with 195 . If he can get healthy and stay healthy, he is a threat to run the table. If Goodhue can win the 5K, 1Mile, and 15K, he gains 300 points and is at 495, but he would own the tie-breaker over Hendrick who has not beaten him this year. Ed Bligh and Andrew Sherwood are in 3rd and 4th now with 250  and 235 . David Cohen who just aged up to this division brings 145  and is entered in the 1 Mile and 15K. If he scores well in those, he can put some pressure on Patterson. M80 Jim Askew won this category handily last year, a fitting way to go out. Askew passed away this spring, lauded as a great champion and a wonderful guy and teammate, by his many Atlanta Track Club friends. It is not clear if anyone will step up to fill in. Jon Desenberg who won the division in 2016, is not currently competing. No one else this year has more than one event completed. Tom Markley and Bill Riley have the lead at 100  with Alan Rider and Harry Carter 95 tied for 3rd. 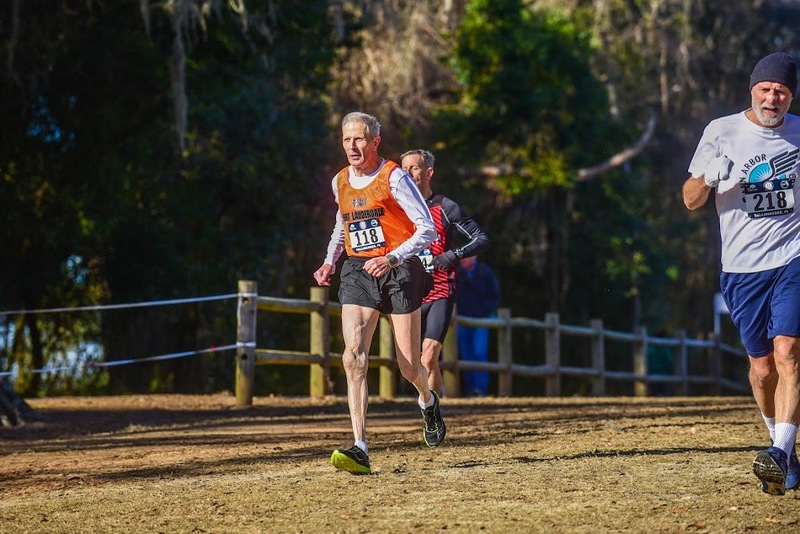 M85 Al Ray has the Cross Country Nationals title to his credit. If he can complete two more championships, he is likely to win this division. W40+ GVH has been the most consistent performer in the Grand Prix contests; they have finished in the top two each year, with 4 wins since 2012. And they are off to another good start with 240 ; they are the only team to have won two events already, taking the 8K and 10K team championships. The Impala Racing team is at 190  on a 2nd at Club XC and a win at the Cross Country Nationals but they would have to contest some of the road races to press GVH. The Atlanta Track Club won at Club XC but have not contested any other events; perhaps their key runners are concentrating on the track this year with the WMA World TF Championships in Malaga this September. W50+ Athena has the most amazing streak; they have won every W50+ Club Grand Prix so far since its inception in 2012. And 2018 looks to be no different; they have 390  while GVH is in second with 370 . Athena has won every event they have entered except one. The lone team to beat them is the Janes Elite of Southern California, who defeated them at Club XC. But the Janes team did not contest any of the other four events thus far; they would have to run the table on the last 4 of the circuit to prevent Athena from winning their 7th consecutive title. W60+ Atlanta will have a tough time repeating as champions; Team Red Lizard started competing more regularly on the circuit over the second half of 2016 but could only amass enough points for 2nd place. This year they have committed to the Grand Prix, presumably with the goal of winning it. Like Atlanta and GVH, the Red Lizard runners have competed in 4 of the 5 events, winning three and finishing 2nd to Atlanta at the 10K when their top runner had an off day. That puts them in first with 390 . If the Red Lizards can win one more event that would almost put it out of reach for the others. But Atlanta, currently with 350 , could still pull it out if they won three of the last four and defeated the Lizards a couple of more times. The Red Lizards currently hold the tie-breaker edge having defeated Atlanta in 2 of the three events they both contested. Atlanta has the depth; when they also have one or more of their top athletes running, they are a real threat to the Red Lizard team. GVH and the Impala Racing team also have a chance. GVH has 310 , but they would need to raise their game over the last four events. The Impala Racing team has finished in the top two in the Women’s 60+ division the last three years, but this spring they only contested the 8K as one of their key contributors was struggling with an injury. Even they could still come back and take the GP title if they are healthy, and contest at least three of the remaining events. But Team Red Lizard is the team to beat. 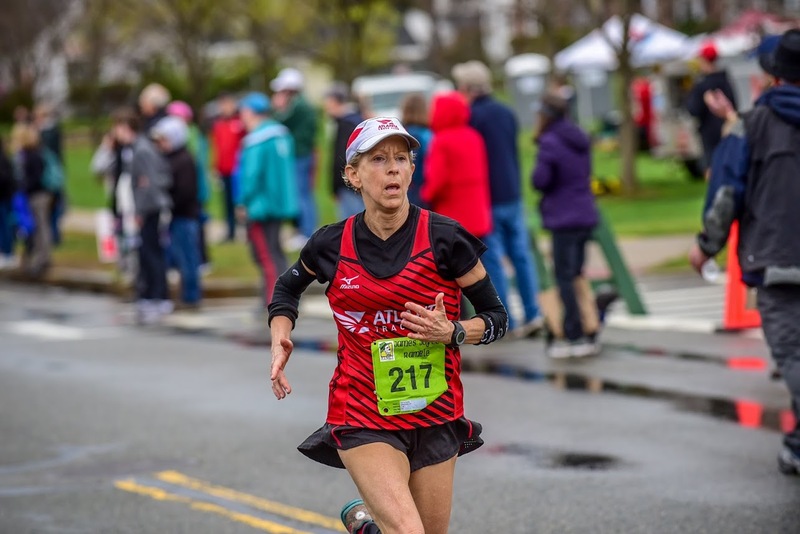 W70+ The Colonial Road Runners entered a team in the 8K and the Atlanta Track Club expects to enter a Women's 70+ team for the 5K. So far there is no indication that the interest in team competition in this division extends beyond a single Championship to the Grand Prix circuit. M40+ The Atlanta Track Club took the first three titles but were displaced by Cal Coast in first the last two years, finishing 2nd and 3rd. This year it is the new kids on the block as far as contesting the Grand Prix goes, the Garden State Track Club New Balance, who are setting the pace with 385 points in 5 races, just 5 points ahead of Atlanta. That seems close, but Garden State has come in ahead of Atlanta in the most recent 4 of the 5 events. Atlanta has their work cut out for them. M50+ The Greater Springfield Harriers are well positioned to repeat as champions. They have contested 4 events and won them all handily. GVH is only 5 points back but they have accumulated those 395 points over 5 events already. If GSH wins one more event that will give them 500 points, a perfect score, and would clinch the 2018 title as GVH’s maximum possible would be 490. The Cal Coast Track Club won the division in 2016 and finished 2nd last year. Cal Coast finished 2nd to GSH at Club XC and XC Nationals but they did not contest any of the three road races this spring. That is partially due to injuries but also to all the races being East of the Mississippi; perhaps some of them are also concentrating more on the track as well. M60+ This Grand Prix division is the tightest. Atlanta leads with 390  but the Shore AC has 390  and the Boulder Road Runners, more importantly, have 360 . Boulder is the only team contesting the Grand Prix to have beaten Atlanta this year, and they are the defending champs. Shore will give the competition its best shot but the other two teams appear to have a little more firepower. A lot will depend on how healthy team members are over the next few contests.There should be some fireworks over the second part of the season! M70+ Atlanta also has the lead in this category with 400 . But GVH, with 380 , has the highest average score per contest. Unless GVH falls apart, they are likely to top out somewhere between 460 and 500. Atlanta is gaining another strong runner for the second half, as Jerry Learned ages up. With Jerry teaming up with Dave Glass, that improves Atlanta’s potential to hold off GVH. Another threat comes from Ann Arbor. Lloyd Hansen has already aged up and helped Ann Arbor win the Half Marathon Team Championship in GVH’s absence in June. 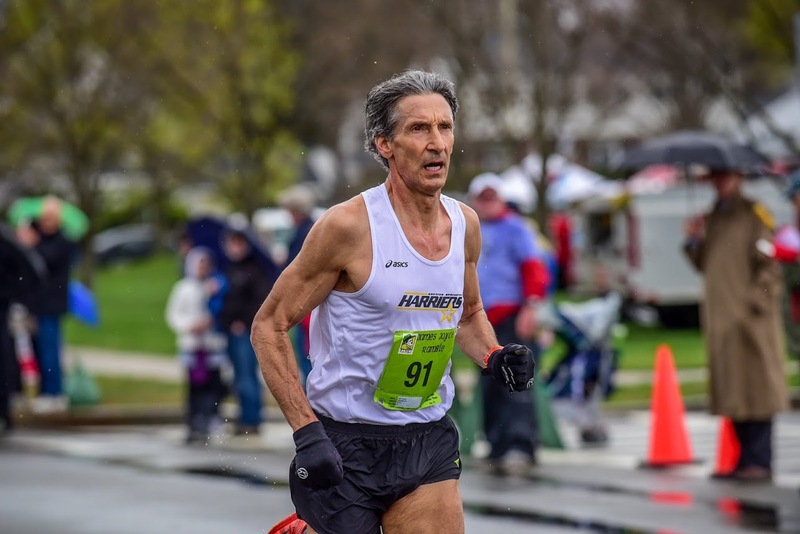 Terry McCluskey, who finished right behind Hansen at the Half Marathon, will join Ann Arbor for the 1 Mile Championship and beyond. If Paul Carlin (that’s me) stays healthy and/or Doug Goodhue comes back all the way, they would be favorites to take several wins this fall. If so, their 260 points on 3 events could rise rapidly toward 500. Like M60+, this one could go down to the wire! That’s where we are now. It will be fun to watch these races for 2018 Grand Prix eminence unfold. 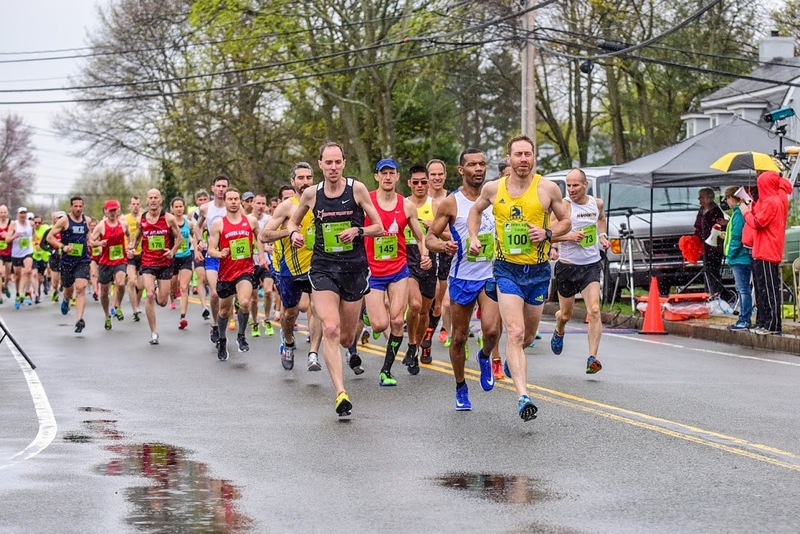 Next Championship races in the circuit are the 5K Masters Championship in Atlanta on August 18th and the 1 Mile Masters Championship in Flint Michigan on August 24th. Don’t miss those two races; they will go a long way toward sorting out some of the Grand Prix podium uncertainties.